Design is many things: it's the giving of form, the shaping of experiences, and – oh, alright then – the solving of problems. In a broader sense, it is the distribution of ingenuity, translating ideas and intentions into realities. And in this light, design is also a matter of mapping and expanding possibility's horizons: telling new stories, and so conjuring paths to new worlds. Design is Storytelling understands this. 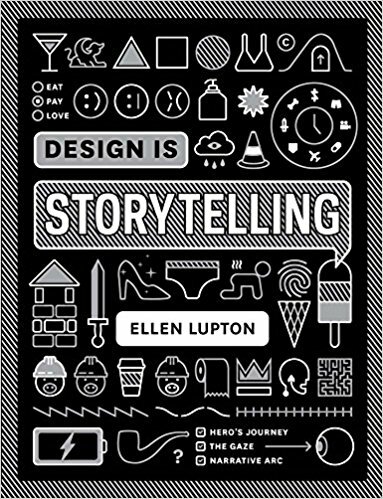 It's a new book by Ellen Lupton, senior curator of contemporary design at Cooper Hewitt (the Smithsonian Design Museum in New York), which is also the publisher of this slim and skilfully curated volume of ways to practice design in narrative mode. 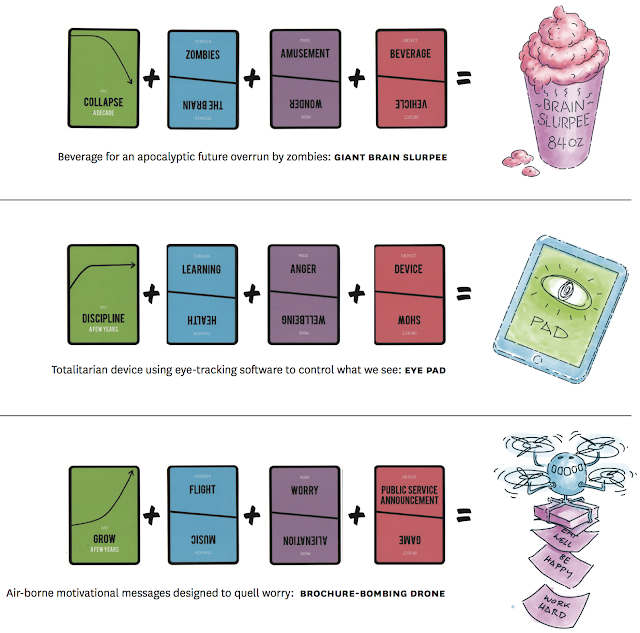 At Situation Lab we're delighted that our imagination card game The Thing From The Future appears in the book as a key example of a design fiction tool. Design fiction is an object-oriented speculative idiom long developed and documented here as part of the wider transmedia landscape of experiential futures, which in turn deals with bringing future narratives to life by all means necessary. The Thing from the Future, created by Stuart Candy and Jeff Watson, is a game that helps teams and individuals build stories about the future. ... The game can be played with groups of students or in community-based workshops as a co-creation activity. [It] is a storytelling machine. Turning the design process backwards, it uses signals from a distant world to inspire new thinking. Candy calls this process reverse archaeology. [link] The results can be humorous or provocative as well as practical. The game stimulates serious conversations about social and environmental sustainability. Design is Storytelling shares several examples of #FutureThing prompts, generated using the original four-suit edition, together with some witty sample responses that are playfully illustrated by Jennifer Tobias (see p. 51). The book is filled with useful tools, and this game is not the only explicitly futures-related one: there's also the cone of plausibility (aka cone of possibility, aka cone of uncertainty; pp. 43-45), and the 2x2 matrix, a widely used process for scenario generation (pp. 46-47). I want to acknowledge the relevance of Lupton's storytelling-centred collection to work that we've plotted here since 02006, and take the opportunity that the book presents to consider, from a personal vantage point, how I've seen design's self-understanding evolving to take advantage of the potential in the design/futures intersection which has been our focus throughout that time. It's heartening to take stock of how things have changed. When I first started teaching futures to design students, as a guest lecturer in Tony Dunne and Fiona Raby's Royal College of Art program early in 02009 (while completing a PhD on futures and design), there was precious little awareness of futures thinking or methods apparent in design education anywhere. Except for some pioneering hybrid practitioners, such as Lloyd Walker, Cindy Frewen, and Jason Tester, there seemed scant overlap between the two worlds (although no doubt precursors and parallels will keep coming to light). My introduction of foresight concepts and methods to design students at the RCA –– not least the cone of possibility itself* –– tapped a kind of latent energy on both sides that heavily influenced my decision to bring futures thinking more systematically to designers. The next year, Nathan Shedroff asked me to create a foresight course in the Design MBA at California College of the Arts. Strategic Foresight is now a core part of the curriculum (the class is usually run by Jake Dunagan). The scenario-generation phase for that first time I ran the course was led by Jay Ogilvy, a former Yale philosopher professor and cofounder of Global Business Network, who at GBN had created a step-by-step process for teaching 2x2 scenario generation. Thanks to GBN's influence, and I believe in large part to Jay's pedagogy, this had become the most widely used way of creating scenarios for organisations around the world. It's gratifying to find Jay's methodological contribution recognised in Design is Storytelling (p. 47). Readers interested in the approach of a hybrid consulting futurist and philosopher should seek out his excellent book Creating Better Futures (OUP, 02002) and more recent journal article Facing the Fold (Foresight, 02011). At the end of 02011 I delivered the closing keynote at AIGA's annual conference, a terrific platform for bringing futures-related ideas to wider attention in the design community. The talk was a little weird, but it helped opened up multiple continuing conversations and collaborations. And meanwhile, OCAD University took the groundbreaking step of offering the first foresight-focused program in a design institution, the MDes in Strategic Foresight and Innovation (SFI). In 02013, OCAD U lured me away from Melbourne and a full-time consulting role at Arup, to Toronto, where I was the first external tenure-track SFI faculty hire, brought on as the program doubled in size to accommodate both full- and part-time cohorts. There, collaborating with wonderful colleagues Greg Van Alstyne and Suzanne Stein, I integrated experiential futures approaches (design fiction, live action roleplaying, etc) into the core curriculum, and led seven iterations of the Foresight Studio over three years. SFI is easily the largest graduate program at Canada's biggest art and design school, and it has by now unleashed well over 100 hybrid design/futures folks into organisations around the country and the world. 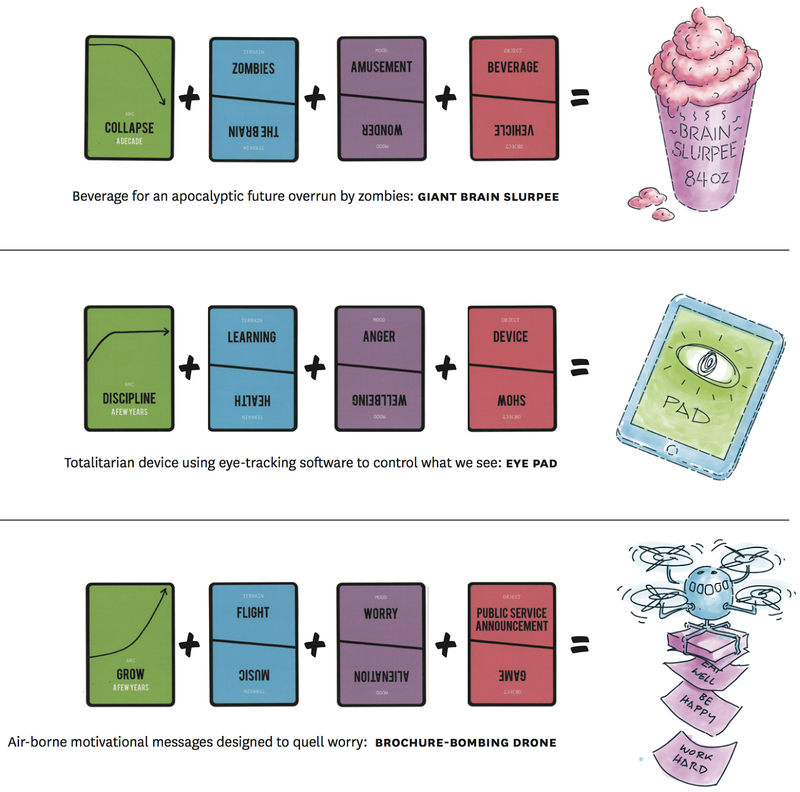 At the same time, Carnegie Mellon University's School of Design has been integrating a form of systems literacy throughout the curriculum, under the banner of transition design. This effort, initiated by Head of School Terry Irwin with Gideon Kossoff, Peter Scupelli and Cameron Tonkinwise (who is now at UNSW), has incorporated a futures perspective since its inception [pdf link]. It has been gradually rolled out across the CMU design curriculum, top to bottom, over the past several years. December wrapped up my first semester on faculty, where I taught the Senior Design Studio alongside Terry Irwin and Stacie Rohrbach, and we formally brought transition design ideas to undergrads for the first time. Our students tackled a variety of wicked problems (food, water, gentrification, air quality, and so on), mapping their contours historically and in the present before using futures tools to examine alternative pathways for the coming decades, and generating stories (visions) for the year 02050 to inspire design interventions for the long term. Methods and heuristics we covered included the cone of possibilities, scenario generation, and design fiction / experiential futures (i.e., methodological staples that have found their way from futures to the pages of Design is Storytelling); as well as some others as yet less widely known in the design world, like environmental scanning and three horizons. Currently, working with colleagues including Peter Scupelli (who has now taught futures at CMU for some five years), Dan Lockton, Molly Steenson, Terry Irwin, and many others, I'm working on braiding a foresight thread through the undergraduate design curriculum. The intention is for it to become part of the standard repertoire of competencies used by and expected of 21st century designers. So it's nearly a decade that my colleagues and I have been working to deliberately infuse futures methods into design education; and there are of course many other strands in this bigger story alongside the ones I can recount from first-hand experience. But this is a personal story that reinforces Ellen Lupton's core insight: design's storytelling – and worldbuilding – potential, though always present, has lately been moving from marginal to something much more central. There's a wealth of further fuel for that fire in Design is Storytelling, both futures-flavoured and not, and the book manages to be both highly attractive and, in the best sense, utilitarian, while documenting a moment in time where design's recognition of its narrative possibilities and responsibilities only continues to grow. Check it out.